It’s when a cab driver nonchalantly sticks a hand out of their window, when you really need to stick the anchors on. 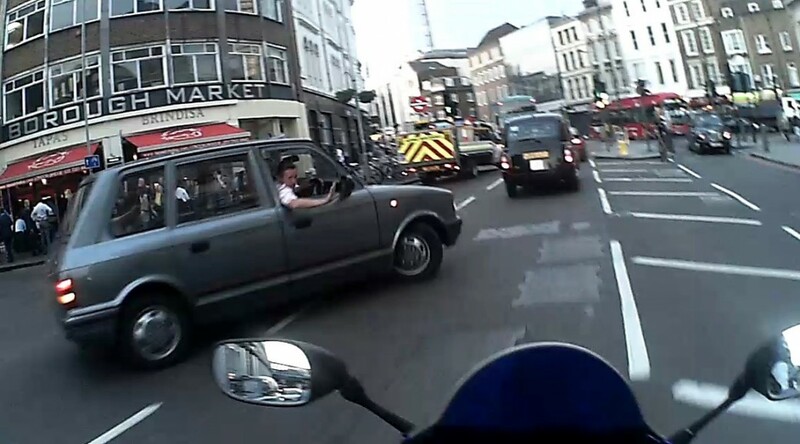 As you soon learn in London, a Cabbie’s hand out of the window is a profound gesture of biblical nature, for it will truly part the seas of traffic, across all lanes and denominations to allow the Londoner’s saviour, the black cab to perform a U-turn. Come what may, no matter time of day or Sabbath, with no fear of other infidel road users present, the tarmac in front of that cab will be thy blessed and none shall interfere nor blaspheme. Thy shall let that cab perform thy holy U-turn decreed. Upon completion of this latter day miracle the tides of chemical emissions will crash forth, the sea of traffic will return and no enemies shall follow thy holy black cab as they deliver another fair paying city apostle to the promised land. ‐ Christopher. Licensed Taxi 40666.